Morning Recovery Drink Reviews - Is it a Scam or Legit? Morning Recovery is a dietary supplement drink designed to help you start each day fresh, no matter how you spent the past night. The drink is primarily marketed as a hangover cure that helps your body process alcohol more efficiently. 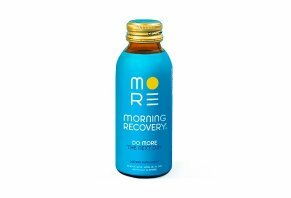 Morning Recovery is a supplement drink designed to help your body process alcohol more efficiently. While the product fulfills FDA compliance by not explicitly marketing itself as a hangover cure, the central premise is that the drink will lessen your symptoms of alcohol indulgence the next day. The drink is sold in 3.6-ounce bottles and contains ingredients like dihydromyricetin to reduce alcohol’s effects on your liver and help you wake up ready to go. The company website tells us that Morning Recovery works best if you take a serving directly after your last alcoholic drink. The longer you sleep, the more time the active ingredients have to work, and the better you will feel in the morning. According to Quartz.com, Morning Recovery is the invention of Sisun Lee, a former product manager at Uber, Facebook, and Tesla. A trip to South Korea (one of the world’s heaviest drinking countries), showed him how reliant the country’s businessmen were on “hangover cures” to make it through workdays after a late night, alcohol-infused business meetings. Believing that opportunities existed to market a similar product in America, Lee founded 82 Labs to make Morning Recovery a reality. Flare.com tells us Lee believes it’s a misconception that Morning Recovery can prevent hangovers altogether. Instead, the product is designed to “boost the body’s response to alcohol” so that you can metabolize it more efficiently. But can Morning Recovery deliver on these promises, or is it destined to leave you feeling as lead-headed as usual after a night of drinking? Let’s look closer at what causes hangovers in the first place to find out. Anyone who’s ever enjoyed a few drinks too many is familiar with the symptoms of a hangover. The Mayo Clinic tells us over-imbibing can lead to nausea, sweating, fatigue, anxiety, stomach discomfort, dry mouth, and a pounding headache. According to Forbes, it’s commonly believed that dehydration and a loss of electrolytes trigger hangovers. However, some research challenges this view by revealing that there is no correlation between dehydration and the severity of a hangover, meaning other factors are also responsible. In contrast, the founder of Morning Recovery believes that hangover symptoms are linked to the liver. In Lee’s view, hangovers occur when the liver fails to properly break down acetaldehyde, a substance produced when your body breaks down alcohol. Smithsonian Magazine validates this view. They state that acetaldehyde is between 10 to 30 times more toxic than alcohol and that the rate your body can process it impacts the severity of hangover symptoms like skin flushing and nausea. This means that you are more likely to experience a hangover when acetaldehyde builds up faster than you can process it. Hangover remedies like Morning Recovery claim to help break down this substance faster, consequently preventing or reducing the severity of hangovers. How does it accomplish this? An extract called dihydromyricetin is the secret. Dihydromyricetin (DHM) is a potent flavonoid extracted from the oriental raisin tree that has been used for centuries in East Asia as a liver aid. According to Business Insider and DHM Depot, the compound helps the liver break down toxins like acetaldehyde faster. When isolated from the raisin tree it comes from, dihydromyricetin will block the action of alcohol on the brain and reduce symptoms of drunkenness, while also speeding up recovery from alcohol. Some research shows that Dihydromyricetin speeds up the alcohol metabolism process so that you can process it before levels build to the point that they affect your brain. Likewise, the product website states that DHM minimizes alcohol’s effects on your body, lowering your chance of developing headaches or brain fog after an evening of drinking. We also found a study from the Journal of Evidence-Based Complementary and Alternative Medicine that referenced dihydromyricetin as a traditional treatment for the effects of alcohol, though not necessarily as a hangover aid. All this to say, according to websites like these, DHM isn’t a miracle product capable of bringing your blood alcohol content to 0 in minutes. DHM Depot notes that the compound’s effectiveness varies from person to person due to natural differences in their metabolisms. It’s clear that more research is needed to improve understanding of the potential of this compound for curing hangovers, and Morning Recovery is working to make that happen. What Scientific Research Exists for Morning Recovery? Morning Recovery contains DHM, but is there any evidence that the compound works as promised in the drink? Forbes tells us that 82 Labs (the processor behind Morning Recovery) teamed up with Dr. Jing Liang, M.D. Ph.D., a University of Southern California professor at the School of Pharmacy. Dr. Liang’s research has revealed how dihydromyricetin can counteract the effects of alcohol when taken immediately after indulging. “Morning Recovery has the necessary ingredients, knowledge, and technology to help you. I’m a strong supporter of Morning Recovery’s mission to continue creating the healthiest products for the world." At the time of writing, we found published research online (with Dr. Liang as a co-author) about the benefits of dihydromyricetin for potentially lowering the risk of alcohol substance abuse, but little further research about its role in hangovers. Flare.com tells us that Morning Recovery is continuing to fund research at 82 Labs to advance the scientific understanding of what happens physically when you drink alcohol and how to affect the process. In fact, when the company updated the drink from version 1 to version 2, they made the proprietary DHM extract ten times stronger to improve its impact. What are the Other Ingredients in Morning Recovery? While the Morning Recovery website states that they consider DHM to be their superstar ingredient, each serving contains other elements that they claim will clear your head faster after a crazy night. Vitamins C & B Complex: Colorado State University Extension tells us that B complex vitamins and C vitamins are water-soluble vitamins that you must take in each day to keep your levels high. Adequate levels of these vitamins will support your body’s production of enzymes, ensuring that you stay sharper and healthier overall. Electrolytes: According to Medical News Today, electrolytes are substances that conduct electricity when they are dissolved in water. Humans need electrolytes to survive, as the small electric current they produce is vital for many bodily functions. Hard exercise, drinking alcohol, and general dehydration all deplete your electrolyte levels, making it essential to replenish your levels. Milk Thistle: As a type of daisy in the ragweed family, milk thistle is a common natural remedy in the Mediterranean for liver problems like cirrhosis, gallbladder problems, and jaundice. The National Center for Complementary and Integrative Medicine tells us that silymarin, the active ingredient in milk thistle, is known for its anti-inflammatory and antioxidant properties that detoxify the liver, especially when it processes alcohol. NAC (N-Acetyl Cysteine): WebMD states that NAC is a potent amino acid that can neutralize toxins in the liver by boosting the levels of antioxidants that can break down acetaldehyde. As a result, NAC is often used to prevent alcoholic liver damage and in hangover remedies like Morning Recovery. Prickly Pear Extract: This cactus extract has long been used as a hangover cure. According to Medscape, the research isn’t conclusive about its effectiveness, though initial studies are promising that it works better than a placebo. The compound helps to combat the effects of liver inflammation to keep it functioning better, and it can ease unpleasant morning-after symptoms like headaches, nausea, and dry mouth. Taurine: According to WebMD, this conditional amino acid is an organic compound that is used to treat congestive heart failure, liver disease, and high blood pressure, though it’s often added to energy drinks to improve mental performance. Morning Recovery’s website states that they get taurine from a vegan source, instead of the meat and fish it is most regularly found in. What Can We Learn from Morning Recovery’s Ingredients? Based on what we learned from resources like the Colorado State University Extension and the National Center for Complementary and Integrative Medicine, it appears that Morning Recovery’s ingredients are well-suited for putting your body into recovery mode after an evening of indulgence. They don’t contain any silver bullets for alleviating a hangover altogether, but the drink comprises compounds like antioxidants and anti-inflammatory agents that could give you a better chance of recovering faster. Likewise, these sites didn’t report any known side effects associated with these ingredients, meaning that you can likely drink it without concern. While Morning Recovery states that they invented the drink to fill a gap in the western market, there are a few hangover \ products already on the market, including Before Elixir. This drink is also marketed as a ‘next day recovery’ drink and contains almost identical ingredients to Morning Recovery, including milk thistle, DHM, and B-complex vitamins. It’s also sold through the product website at a nearly the same price point. However, since both drinks are proprietary blends, it’s unclear how much of their active ingredients they contain. Can you get a similar benefit from a sports drink like Gatorade? According to the previously mentioned research about hangovers, these drinks will only combat the effects of dehydration, not the formation of acetaldehyde that leads to the worst of your post-alcohol symptoms. While research on the leading causes of hangovers is still forthcoming, the evidence shows that ace acetaldehyde may play a more significant role than previously thought. Morning Recovery is available on the company website and through online retailers like Amazon. In time, the company plans to improve their physical retail footprint so that you can buy the drinks at liquor stores and supplement shops. At the time of writing, Morning Recovery can be bought in a six-pack ($29.95), twelve-pack ($54.95) and twenty-four-pack ($99.95). It’s also possible to save 10% off every order by signing up for a subscription where you are automatically sent a new shipment every 30, 45, or 60 days, depending on you what you request. The website states that all subscriptions come with a cancel-anytime and money-back guarantee policy. For those not ready to commit to a full order, Morning Recovery offered free samples (plus $2.95 for shipping) at the time of writing. Take note though, as the free sample will auto-enroll you in the monthly 6-pack subscription program unless you chose to opt out of it. For questions, concerns, or further information about Morning Recovery, you can contact the company directly at support@morningrecoverydrink.com. We found a few reviews of Morning Recovery online. On the company website, reviews were overall positive. Many mentioned that the drink worked as stated when taken after a night of drinking and that it was pleasant tasting and easy to drink. Others noted that they felt five times better in the morning after taking it than when they didn’t, and that it worked best if they slept for at least nine hours after drinking it. Amazon also has many reviews for Morning Recovery. At the time of writing, the drink had over 120 reviews and averaged 4.3 stars out of five. Many reviewers noted that the drink left them refreshed and energic the day after a night of drinking, and others mentioned that they kept the beverage on hand at all times. In a few instances, the reviewers stated that the drink didn’t make much difference for them, while others were clear that the taste and effects felt worse to them than a regular hangover. Several staff members at Flare.com gave Morning Recovery a try and documented their experiences. While some testers were pleasantly surprised by the results, one woke up with one of the worst hangovers she had ever experienced after drinking it. Will Morning Recovery work for you? Even the company website states that it’s hard to predict. Everyone’s physiology is different, so the best way to know for sure is to try some for yourself and see what the effect is for you. Our View: Who Should Try Morning Recovery? Few things feel more debilitating during an early morning than a bad hangover, so you’ll be forgiven for trying to source a magic cure to make yours go away. Will you find the solution in Morning Recovery? Based on what we learned from authoritative sites regarding the clinical evidence for its ingredients, the odds are the drink won’t cure all your alcohol ailments, but it could make a positive difference. Despite the reported lack of scientific research currently existing for hangover cures with DHM, there is substantial anecdotal evidence that it will improve your liver’s ability to process alcohol. Business Insider tells us that the compound has been used in East Asia for over five centuries to ease the impacts of alcohol and preliminary evidence shows that it works. We found the studies that do exist for DHM look promising, and the leading researcher involved endorses Morning Recovery. The other ingredients in the drink also have clinically supported benefits for boosting your body’s functioning with little (if any) risk of side effects. However, overall reviews for Morning Recovery’s effectiveness are mixed, and you might balk at the price tag of over $5 per drink. Deciding whether to try Morning Recovery is a personal decision, but the evidence we’ve uncovered seems to show that it won’t hurt you to try it. Even if the brew’s purported benefits are attributed to the placebo effect, anything that reduces your hangover symptoms might be well worth looking into. Write a Review for Morning Recovery Drink!